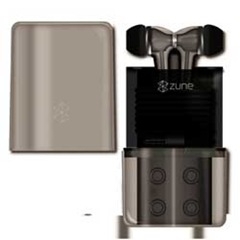 I got word of this great deal from Got Zune who in turn heard about it from Zune Boards: Buy.com has the generation one Zune premium headphones for $19.03 USD including shipping (I suspect to anywhere in the USA), but if you use Google Checkout for the first time you save an additional $10 USD, making your price $9.03. I never got a chance to try these first-gen premium headphones, but if they're anything like the second-gen headphones that come with the Zune 80, they're going to be quite good. Even for $19.03 this is a very good deal.